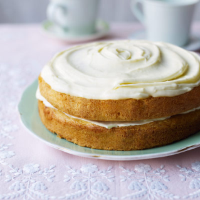 "A simple lemon juice and sugar syrup keeps this cake super-squidgy." 1. Preheat the oven to 180°C, gas mark 4. Line the base of 2 x 18cm round cake tins with baking parchment. Blitz the oats to a powder in a blender or food processor, then mix in a bowl with the flour and baking powder. 2. Put the lemon zest, sugar, oil and eggs into a seperate bowl and mix until smooth, then beat in the cream and butter. Tip the dry ingredients into the egg mixture, fold through evenly and divide between the tins. Bake for 25 minutes, until risen and a skewer comes out clean when inserted into the middle. Leave the cakes in their tins on a rack to cool. 3. For the syrup, place the lemon juice and sugar in a small pan. Heat gently to dissolve the sugar, then set aside to cool. While the cakes are still warm, prick the top of each with a skewer and spoon over the syrup. 4. To make the frosting, beat all the ingredients together until smooth and chill for 30 minutes. When the cakes are cool, layer and top with the frosting.